Viknesh Vijayenthiran November 29, 2017 Comment Now! 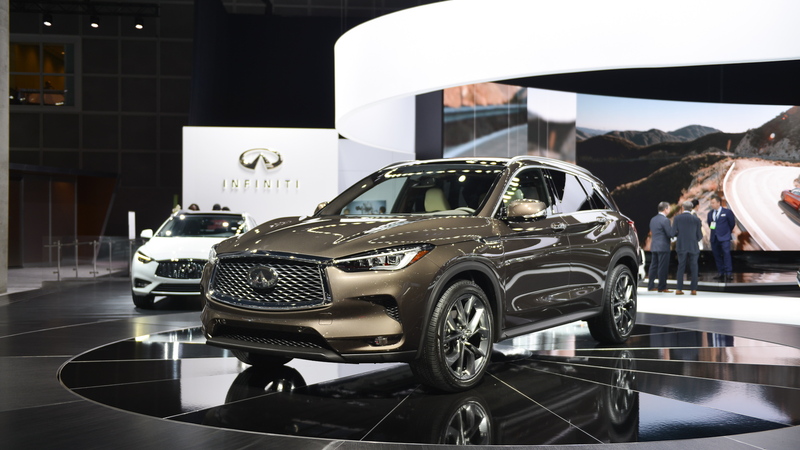 Feast your eyes on the new QX50 from Infiniti. The small SUV made its world debut on Wednesday at the 2017 Los Angeles Auto Show and goes on sale next year, as a 2019 model. 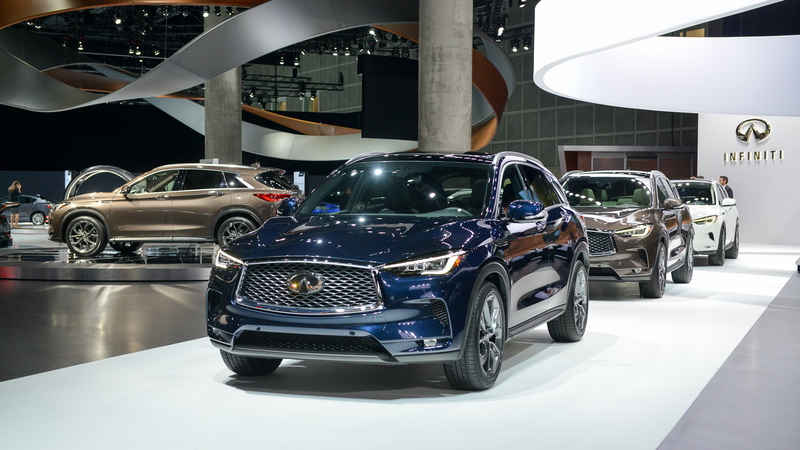 The 2019 QX50’s arrival is a watershed moment for Infiniti, as it also marks the introduction of several key technologies that will define the brand’s vehicles for the next several years. The list includes a new platform, engine and electronic driving aids. The design is hardly a surprise as Infiniti previewed the look with a series of concepts, the most recent having made its debut in January. The high-tech details and sleek lines contrast with the homely look of the outgoing QX50 which actually dates back to 2008's Infiniti EX and is long overdue for replacement. Aside from the more alluring shape, what's under the hood is more interesting. The QX50 is the first vehicle powered by Infiniti's variable compression engine, dubbed the VC-Turbo. The 2.0-liter turbocharged inline-4's mechanical wizardry continuously raises or lowers the reach of the pistons to transform the compression ratio. High compression ratios aid efficiency, while low ratios enable greater power and torque. The engine offers any compression ratio between 8:1 (for performance) and 14:1 (for efficiency). 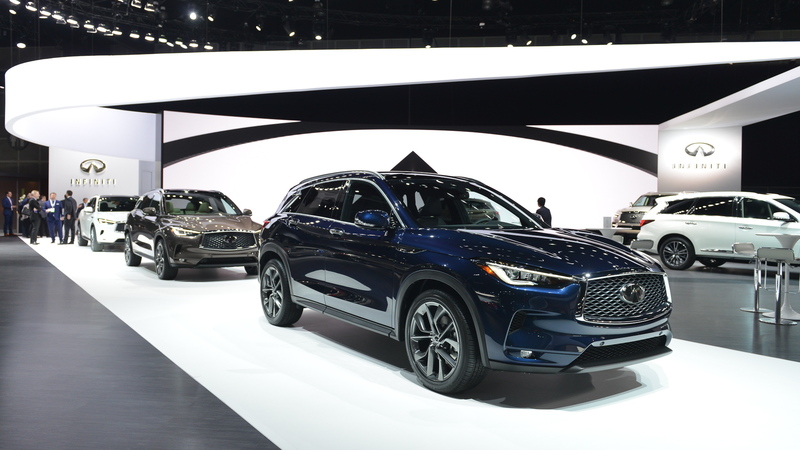 The result is a peak output of 268 horsepower and 280 pound-feet of torque together with an estimated fuel economy of 27 mpg combined in a standard front-wheel-drive QX50. 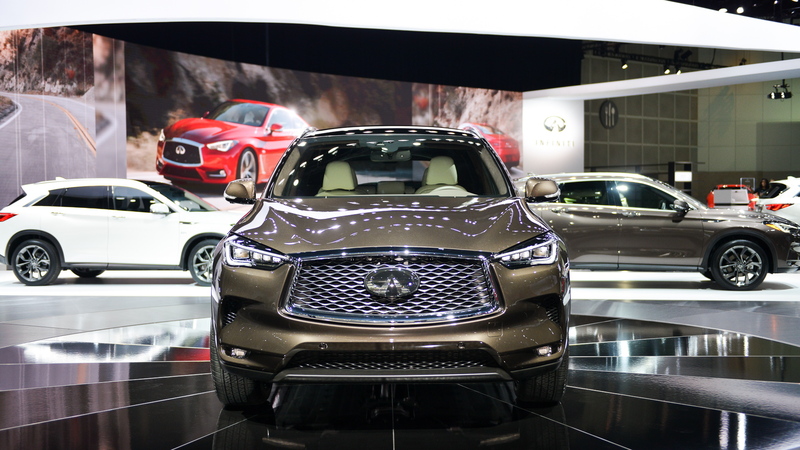 Infiniti estimates that an all-wheel-drive QX50 will deliver fuel economy of 26 mpg combined. Sadly, the high-tech engine is paired exclusively with a dull CVT. Owners can expect 0-60 mph acceleration as low as 6.3 seconds and a top of 143 mph. Owners can also take advantage of ProPilot Assist, Nissan and Infiniti’s suite of electronic driving aids. In the QX50, ProPilot Assist can handle acceleration, braking and steering during single-lane driving on a highway. Underpinning the QX50 is a new platform that’s lighter and more rigid than what’s in the current QX50. Helping make this possible is high-strength steel. Key dimensions for the vehicle include a length of 184.8 inches, a wheelbase of 110.2 inches and a ground clearance of 8.6 inches. The 5-seat cabin features a rear bench that slides and folds in order to maximize storage space. For example, the trunk's volume expands from 31.6 cubic feet to 37 as the rear bench slides fore and aft, and to 60 cu ft with the rear seats folded. The QX50 competes in a crowded segment in which buyers really are spoiled for choice. The list of competitors include the Acura RDX, Audi Q5, BMW X3, Jaguar F-Pace, Land Rover Discovery Sport, Lexus NX, Mercedes-Benz GLC and Volvo XC60. Inside the QX50, bespoke manufacturing methods such as wrap-and-sew detailing add a real touch of luxury. The leather on the dash is selected for its quality and is hand-wrapped over the edges of the panels. The seats, door panels and dashboard feature a laser hole-cut stitch pattern specifically tailored to follow the curves of the interior surfaces. Contrast color stitching is used on the seats, paired with piping for a further look of luxury. Pricing information for the QX50 will be announced closer to next year’s market launch. The vehicles will be sourced from a new plant in Mexico jointly owned by Infiniti parent company Nissan and German auto giant Daimler. Daimler will use the plant to build next-generation Mercedes-Benz compact cars. 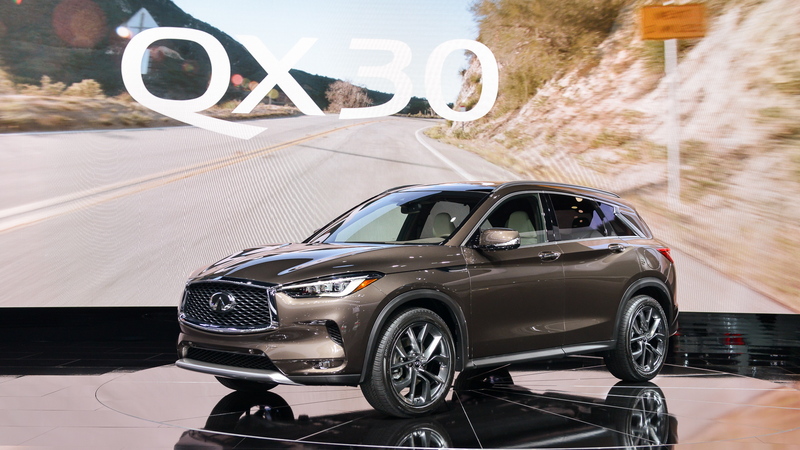 For more on the Infiniti QX50, read the in-depth reviews at The Car Connection. And for more from the L.A. Auto Show, head to our dedicated hub.